6.50 points at 16 votes (rank 504). 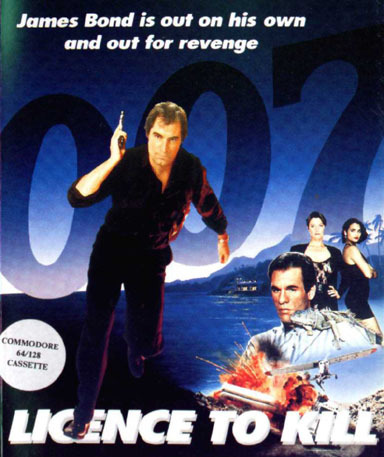 In 1989 Timothy Dalton had his second (and last) movie job as James Bond. The name of the movie was "Licence to Kill". Domark used this as an occasion to publish a game with the same name, which set itself pleasantly apart from the forerunners. Bond chases the dangerous drug baron Sanchez, who floods the USA with a large quantitiy of drugs. 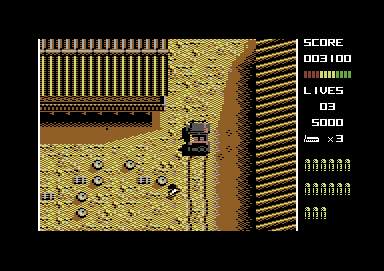 The game consists of several independent levels which all exist as scenes in the movie and require much skill and partially also the ability for tactical approaches. 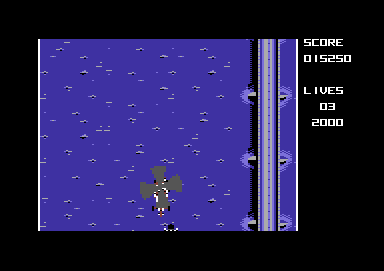 All levels are shown from the bird's view. 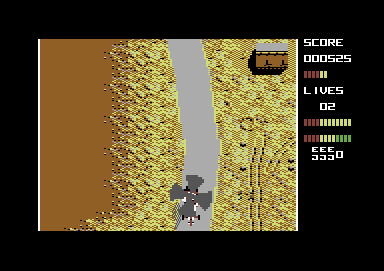 The graphics are detailled and the used colours are pleasant. The playability is excellent, only the difficulty grade was set a bit too high. The course of the game is diversified. But you have to lower your expectations for the intro. The typical James Bond prelude is almost completely missing. Only the white dot is there. There is no view out of the muzzle in this game. 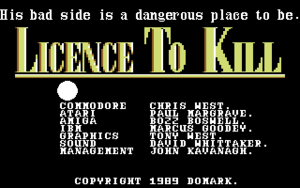 You will also search in vain for a proper title screen or an end sequence. Here you need to chase the escaping enemy Sanchez - who drives along a street with a Jeep - with the helicopter and avoid houses and shots. Bond needs to fight through a hostile area by foot. Here you need to keep Sanchez's men from escaping and beware of not being shot yourself. In this level you need a tactical approach. Sanchez flies back to Cuba with the plane. Bond ropes down from a helicopter and needs to try to cling to the tail of the airplane. Here Bond needs to swim for his life and dive, because Sanchez uses divers and rubber boats against Bond. To take the harpoons from the divers you need to swim over them and press the fire button. Bond can dive beneath boats (Joystick forwards). Collected packages with drugs get you bonus points. To hang onto the plane (and with this get to the next scene) it needs to be hit with the harpoon. Bond has made it to hang onto the water plane with the harpoon and converts his feet to water skis. Now you need to avoid rocks and other obstacles. Bond needs to get to the plane to be able to take it over. Bond has destroyed the drug factory of Sanchez, but he himself has escaped and tries to get over the border. 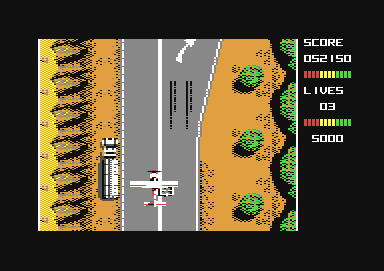 Bond needs to be put down by a plane onto a truck (steer the plane from behind over the truck until the display for putting down appears) and with this destroy all trucks by forcing them off the road until he reaches Sanchez's truck. The version by "711" offers the following cheat modes: unlimited lives, unlimited energy, no damage on the truck in the last level, unlimited air supply in level 4, no time limit, unlimited ammunition. 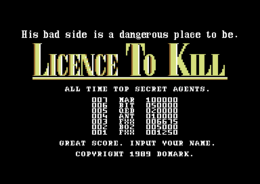 H.T.W: "The single movie scenes were converted to well playable levels. 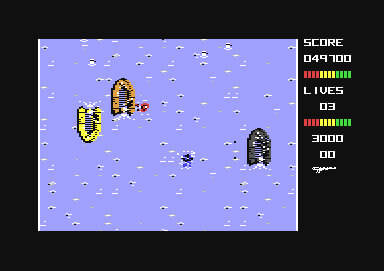 Also the controls (except for the second level where aiming is a bit notchy) are simple and exact. Graphics and sound are not above average but well done. Only the difficulty level is partially extremely high. Furthermore, a proper end sequence and a saveable highscore list is missing. 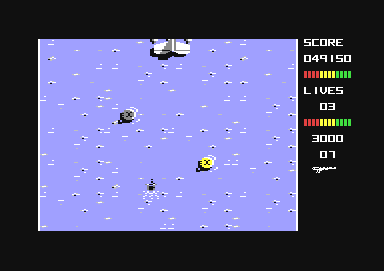 Nevertheless: The best Bond for the C64". This page was last modified on 3 October 2016, at 14:29.